When the weather keeps me cooped up indoors, I like doing creative projects that keep me busy and beautify my space at the same time. 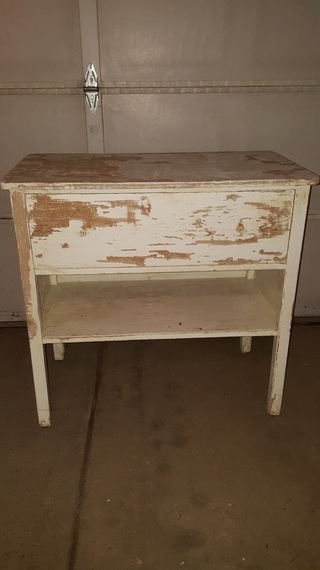 One project that's been languishing since last summer is refinishing an old cabinet. I have a big soft spot for anything retro or vintage. Because I love the inherent history in old items, I rarely refinish them. The scratches, the dents, and the chips are all part of their stories. 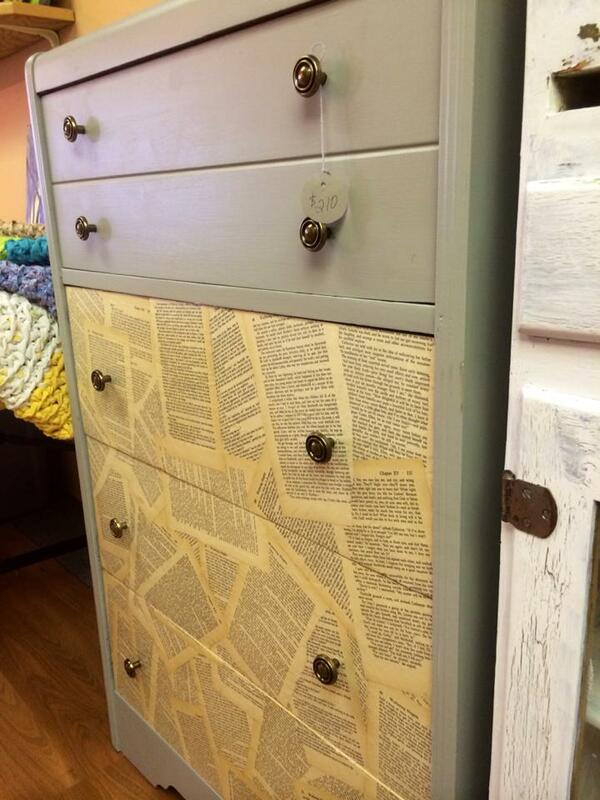 But upcycling old furniture is quite trendy now, and I've seen so many beautiful ideas. I wanted to try it. To be honest, I found my cabinet at the side of the road, with a "free" sign on it. But if you're interested in trying your hand at this too, there are all kinds of places where you can find old furniture on the cheap. Checking garage sales and charity shops is certainly worthwhile, but it might be easier to look online. Facebook has lots of local "buy and sell" groups and sites like kijiji.ca are a treasure trove for used furniture. Be creative in your choices. 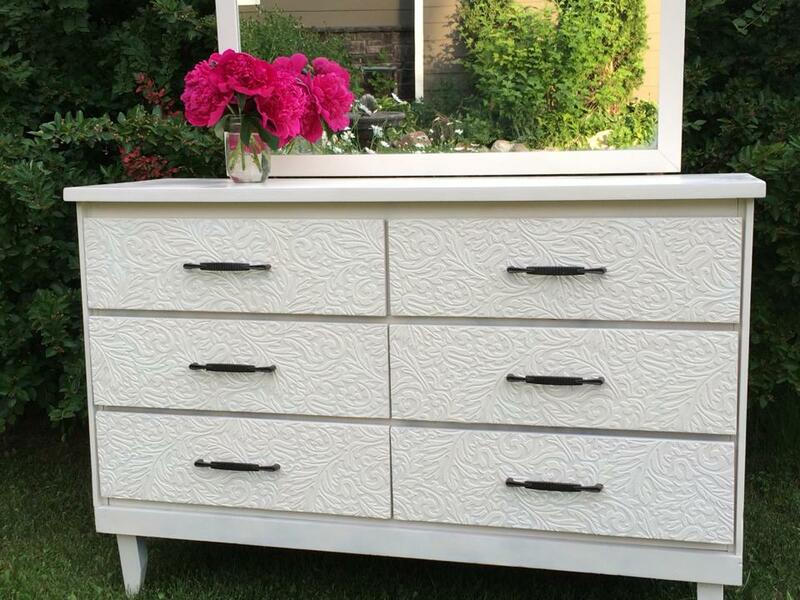 A lot of the furniture upcyclers I follow on Facebook focus on dressers, side tables, and buffets. But headboards can be beautiful projects, as can coffee tables. Don't forget to consider options for repurposing items as well. Upcycling is taking something old and making it better, while repurposing is taking an item originally intended for one job and giving it a whole new purpose. For example, end tables can be repurposed into dog dens; entertainment centers can be repurposed into children's play kitchens; and coffee tables can be repurposed into ottomans. There are so many great ideas out there--do a little research on Google or Pinterest to get your creative ideas flowing. Image courtesy of Marissa Denis. Used by permission. 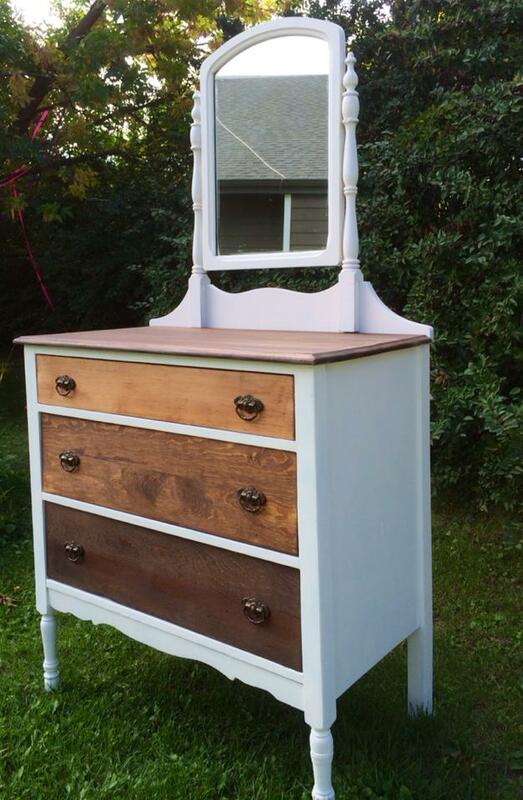 Whatever you choose to upcycle, you will need to start by sanding. My cabinet had a glossy finish and I thought I had to sand that baby right off. 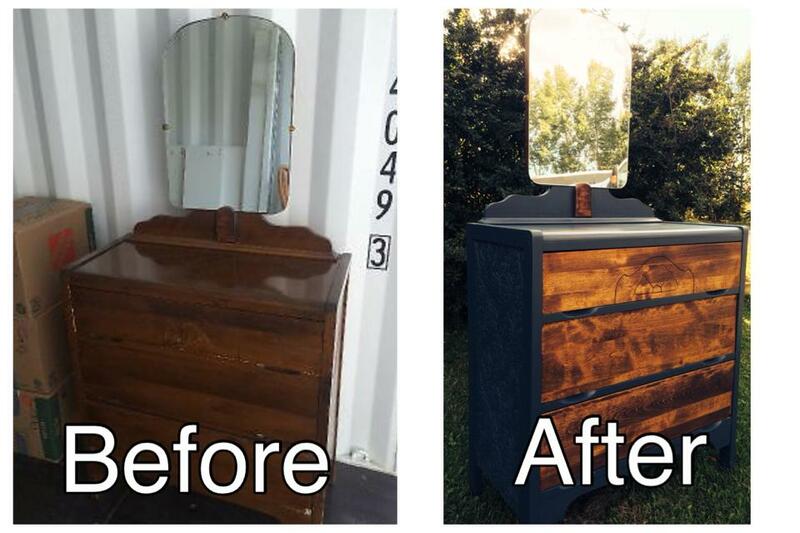 Not so, as explained in this blog on furniture repainting. You just need to rough up the surface so that the primer has something to adhere to. Sanding is best done outdoors (if the weather isn't brutally cold) or in a garage or shed, if you have one. Once the sanding is done, you can achieve a simple updated look by applying three coats of paint--sanding in between each--and then applying clear Polycrylic for a protective finish. If you prefer, you can take it a little further, and apply one of those creative finishes you found on Pinterest. I tend to fly by the seat of my pants when doing projects like this. The blog I mentioned above suggests of laying down a tarp under your project. To be honest, I would have never thought of doing so. (At least not until I dribbled paint on the floor.) I wondered if there were more obvious tips that beginners like me should consider. I spoke with Marissa Denis, a local upcycler and owner of Apple Tree Heirlooms, to get her ideas. JA: What is your number one tip for someone who's about to upcycle her first piece? MD: Have fun and try new things! I feel like what makes your finished product truly special is that it is unique and speaks to your own style and creativity. Don't be afraid to make mistakes, as most mistakes are fixable. On a more practical note: Don't skimp on sanding! It is by far the most monotonous part of the process but greatly affects the finished product. JA: Are there tools that are handy to keep close by, beyond the basic paintbrushes and sanders? MD: When working on furniture, especially antiques, the previous finishes are sometimes questionable. Always wear a proper mask when sanding or removing these finishes. Having a drill charged and ready, with a set of assorted drill bits is also a good idea. Removing and replacing hardware and hinges can sometimes be a headache and being prepared for that ahead of time will save a lot of time and frustration. Finally, ensure that your workspace has proper lighting. It is very disappointing to notice flaws once your project is complete and you move it into different lighting. JA: What are your favourite ideas for creative finishes? I saw the dresser that you refinished by adhering book pages to the drawer fronts and I loved that one! It could so easily be customized with pages from a favourite book or record album art or ephemera. MD: My personal favourite was a crackle patina that I recreated on an antique hutch this past summer. 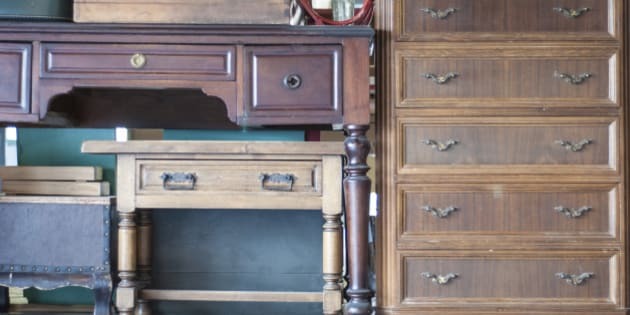 I went on an antiquing trip with my mother and absolutely fell in love with a very rustic, old cabinet adorned with that authentic crackled and chipped look. I managed to recreate the look by layering different dark shades of paint and then covering it with glue. When the glue was still tacky, I applied a coat of contrasting paint (antique white). While drying, the top layer will separate, creating that crackle look. I increased the amount of crackle by using a blow dryer in the last step. Whatever you choose to do, it doesn't have to be an expensive project. The castoff pieces that you find may be free or very cheap; and you may already have most of the tools and supplies needed for a project like this, down to leftover paint. Why not try it? It's fun to break out your creative chops on a new project, and pretty up your home at the same time. And speaking of which, I should probably practice what I preach and get busy finishing my own project.